Building of houses in Seabury began in 1983.3 The familiar patchwork appearance of fields bordered by hedgerows upon which Seabury and other Yellow Walls’ estates are built (e.g. Millview, Ard Na Mara) is a result of ‘Enclosure Acts’ which were enacted by Parliament in the 1700s. These Acts encouraged the planting of hedgerows as a means of marking field boundaries.4 Prior to the enclosure acts, most land in Fingal was unenclosed commonage. These fields were largely used for farming activities. The newspaper advertisement9 below appeared just 4 years before Ard Na Mara was built and gives an insight into the character of the area at that time. 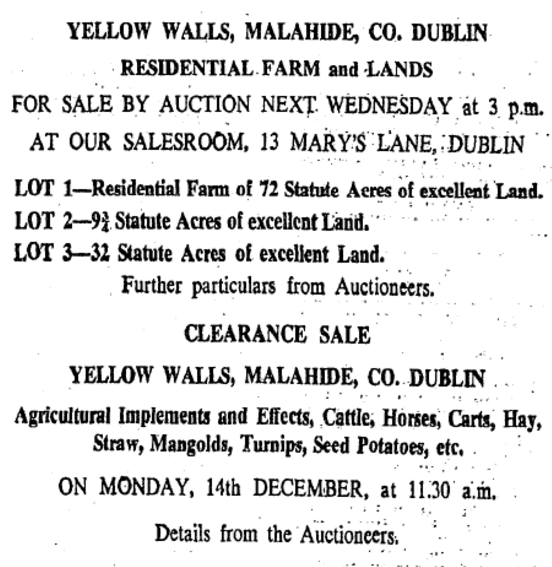 Newspaper notice from 1959 advertising the sale of farmland, agricultural implements, livestock and crops in Yellow Walls. © Irish Times. 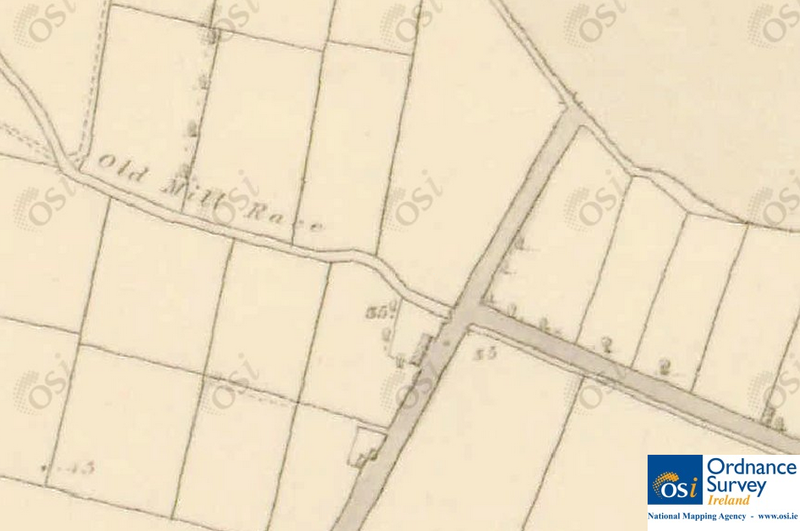 Historical ordnance survey maps2† show that the farm lands of Seabury had extensive frontage onto the Broadmeadow Estuary at Old Yellow Walls Road. This is now Estuary Park, an 8 acre park with a children’s playground, playing pitches and exercise equipment. 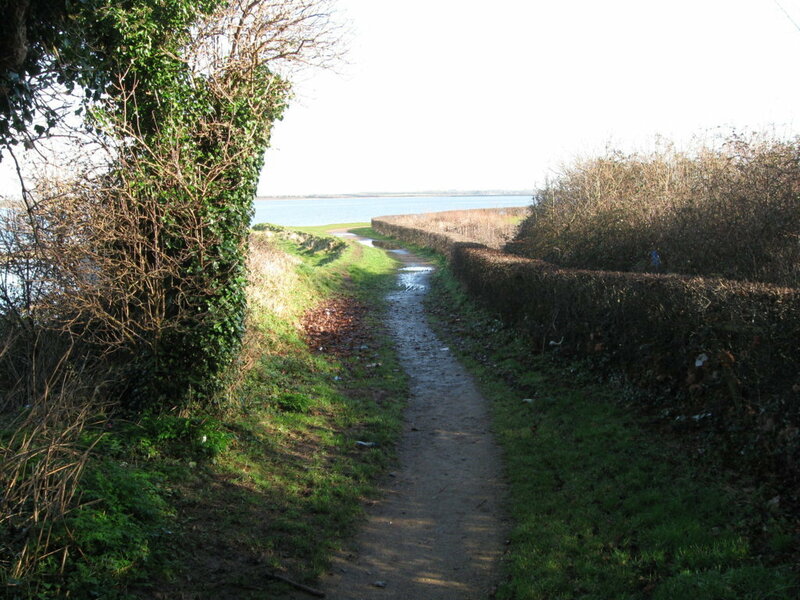 A pathway that runs around the green leads down to the waterfront before continuing on to Cave’s Marsh. 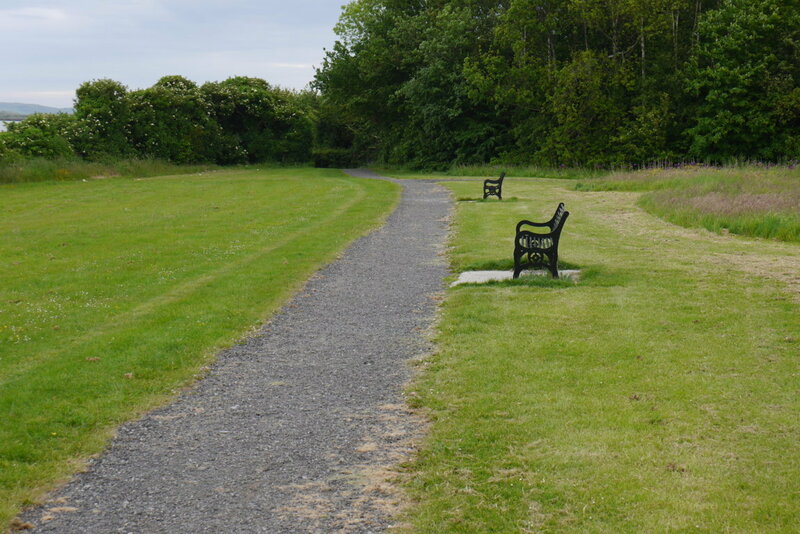 This pathway may eventually form part of a walking and cycle route around the entire Broadmeadow estuary. 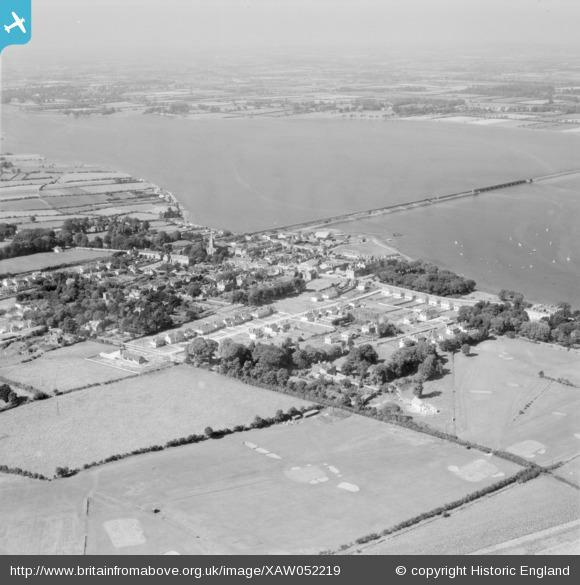 The historic maps indicate a now demolished building fronting onto Old Yellow Walls road at Estuary Green. There is also a well marked on the opposite side of the green beside the route of the ‘Old Sea Road‘ and another well marked at Tudor Court, which fronts on to Estuary Road. The Yellow Walls’ parish church (RC) is the ‘Sacred Heart’ (Yellow Walls’ parish was constituted from St. Sylvester’s, Malahide in 1996) and it is also located on Estuary road, as is Saint Benedict’s, a communal living scheme for senior citizens. Killeen itself is named after Killeen Terrace in Malahide village, built in 1835 by John Killeen, who was also instrumental in the building of the railway viaduct across the Broadmeadow estuary. 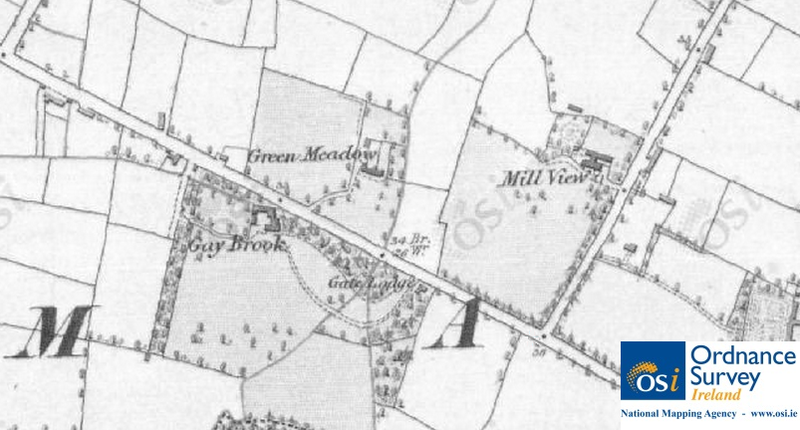 Across the road, in what is now the Talbot estate, stood Gaybrook House, after the stream of the same name. This was once the home of the Rev. F. Chamley, after whom nearby Chamley Park is named. 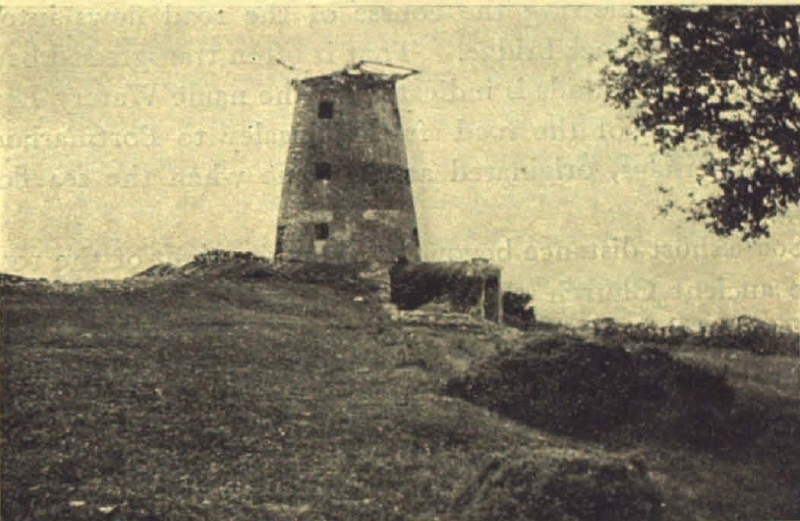 It is described in the 1836 Ordnance Survey as a “neat 2 story slated house in good repair and pleasantly situated. The demesne contains 14 3/4 acres.”10 The house was demolished in 1959. 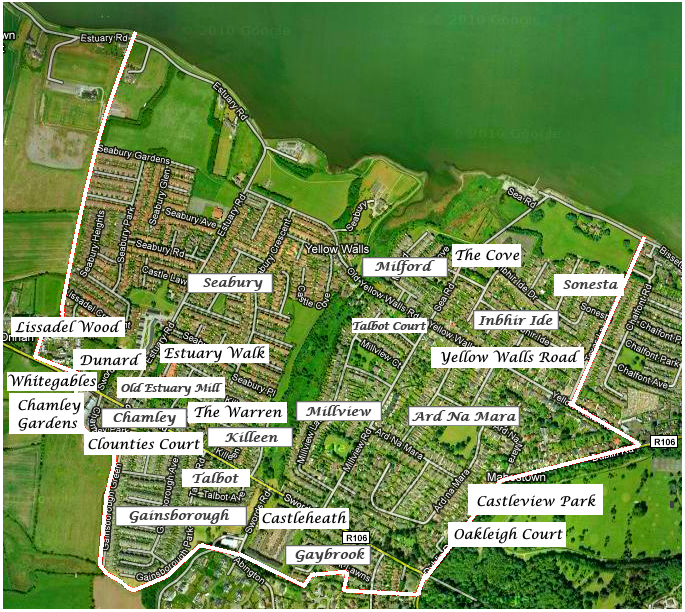 Further along the Malahide-Swords road towards Malahide Demesne, we have Gaybrook Lawns. Gainsborough is named after the sinking of the ship of the same name in 1838. The construction dates of the residential areas in Yellow Walls are shown below. †The first complete ordnance survey of Ireland took place between 1829 and 1842 and resulted in a series of maps at a scale of 6 inches to one mile (referred to as Historic 6″ on the OSI map viewer). A second survey was completed between 1887 and 1913 resulting in a series of maps at a scale of 25 inches to one mile (referred to as Historic 25″ on the OSI map viewer). 1. Irish Independent, May 16, 1963. 2. Ordnance Survey Of Ireland, 2011, Public Map Viewer [online]. 3. Irish Independent, Jan 20, 1984. 4. Aalen, F. H. Man and the Landscape in Ireland , Academic Press, 1978. 5. Survey of the Town and Lands of Malahide. Clarges Greene & Son, 1851. 6. D’Alton, John. The History of the County of Dublin. Hodges and Smith, 1838. 7. Ordnance Survey Of Ireland 6″ Map: online. Reproduced under licence from Ordnance Survey of Ireland; Licence No. NE 0000414. 8. Irish Times, October 29, 1929. 9. Irish Times, December 5, 1959. 10. Ordnance Survey Field Name Book: Malahide, County Dublin, 1836.